Attorney Chris Macturk was tired of adding to his clients' stress by charging them by the hour. Every call, email and meeting became a source of anxiety and challenged his clients to make him a true partner. Chris decided to leave the comforts of his large firm employer to set out on his own using a new pre-agreed pricing model. He hired Pinch Hit Partners to launch the new firm and to create a unique brand in the legal services marketplace. Pinch Hit Partners consultant Mark Cipolletti developed a marketing plan for the new firm - the first project being the creation of a business name. "Developing a brand name and not naming the law firm after its principals was very intentional and surprisingly unique. We want clients to know that we're focused on their needs, not our egos or bank accounts. To be authentic and unique we felt like this had to start with the name itself," says Mark. Mark partnered with RedOrange Slice to develop a logo, business collateral and a website for Evolution. Once those items were in place, promotions were started to build brand awareness in the local market and communications were launched to encourage referrals from Chris' network, built over his 20+ year career in family law. As expected, in the early months of operation, most of Evolution's clients came from referrals. 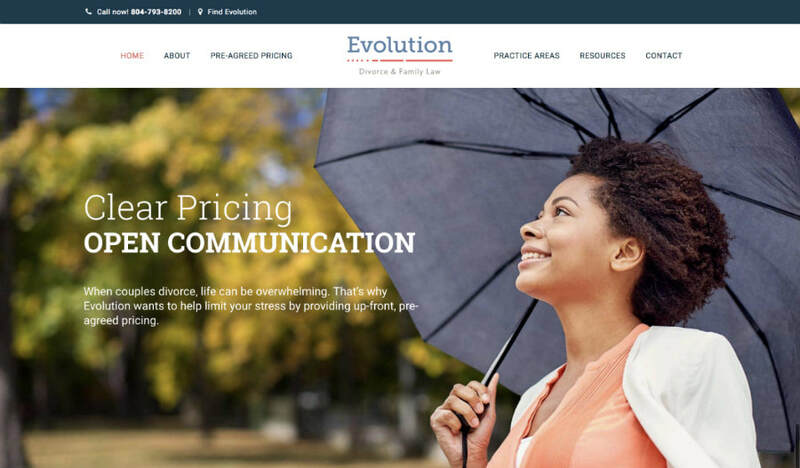 Now, almost one-year since launching, Evolution's website is producing half of the firm's new business. Clients are especially attracted to the pre-agreed pricing model which separates Evolution from every other firm in town. A conversation doesn’t cost you a thing. Contact us today to learn more about how Pinch Hit Partners can transform your marketing and sales.